Pandita Aseem Krishna Das Babaji is a disciple of Pandita Ananta Das Babaji Maharaja and a scholar of Vaisnava grammar and philosophy. He is also a talented artist. Aseem Krishna Das Baba is presently writing a book in Bengali which will be titled "Shrestha Tattva Shri Radha", which I believe will eventually be translated into english. A great addition to our literature which will be available for the future generations as well. Karunamayi das, an Italian disciple of Sri Ananta das Baba and a long time resident of Radhakunda is helping with the book. Pandit Aseem Krishna Das is writing it by hand and as we know if he can type it on a computer he can edit, delete, make additions on the text easily, which obviously also saves time. 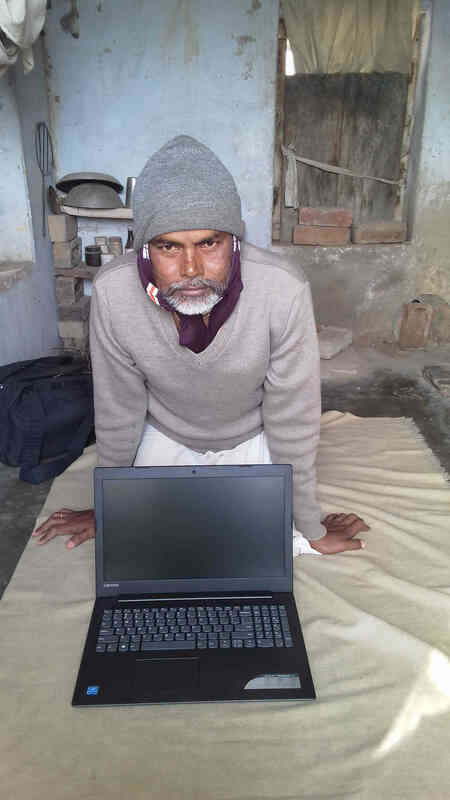 If you want an opportunity to do Vaishnava Seva on this Damodar month, please consider donating money for the purchase of a computer for this wonderful devotee. Any amount will be highly appreciated. Karunamayi das said that in Mathura a computer suitable for PAKDB's use, costs around US $350-400. Please pass on this appeal to other devotees or to your non-devotee friends/family members who may like to help a very good person like PAKDB. Nitaidas will donate and I myself will be donating too. If we are blessed and the donations exceed the amount needed, surely there are many ways it can be used at Radhakunda. And if we don't meet the amount, we will do a second round to find a way to get the computer for Baba. May Lord Damodar bless you as you give. Let me give you an update on the collection that we are taking for Pandit Aseem Krishna das Baba's computer. So far we have collected $287. We need another $83, according to Karunamayidasji, in order to get Baba a decent computer for him to work on. Thanks to everyone who has contributed so far. Malati dasi and I really appreciate your help. Both of us have contributed as well. Karunamayidasji suggested another $80 for an external hard drive to act as a backup for Baba's files, but Malati and I think it unnecessary. One can back files up on thumb drives for much less. Hoping all are well and deep in meditation on the lotus like feet of Radhika and Krsna. satyam param dhimahi! Greetings and regards to everyone. I just wanted to convey the heartfelt gratitude of Pandit Aseem Das Baba to those who have contributed so far. Just for the sake of details I am posting here what I had sent to Nitai Dasji previously : "Greetings Nitai Dasji.....There is a suitable laptop of Lenovo brand for 24000 IR = 370 USD. It has 4 GB of Ram, 1 harddisk of 1 TB, a display of 15/6, and has been manufactured this year in the middle of August. For external safeguarding of data there is an external hard-disk of 1TB for 4450 IR = 70 USD which I think is necessary also. So 370 USD + 70 USD = 440 USD what is needed....."
Thanks to Nitai Das and Malati Dasi for their help. It looks we have fallen short of the amount needed for Babaji's computer. If anyone else wants to give anything please send it on. We still need another $80. I will try to make that up myself, but please help if you can. Thanks again to all who have contributed. I am sure we will be amply repaid by the wisdom of the book Baba produces. PS. I just noticed Radhapada Dasji put in a little more. Thanks Radhapada. Your largess will certainly help. Radhe Radhe! Our contribution with Nitai dasji's contribution will be used as intended. May our love for our ista deva grow day by day. I am happy to report that I transferred the money collected for Baba Aseem Krishna Das's computer yesterday to Karunamayi Das in Radhakunda through PayPal. The money transferred was a bit more than the cost of the computer because it had to be transferred as a business transaction through PayPal and PayPal naturally took a cut. Anyway, enough money was sent to cover the computer's cost, but not the external drive Baba wanted. We can perhaps send that later. We await Karunamayi's report on the purchase of the computer. Karunamayidasji informs me that he has received the money and as soon as it clears his bank he will go with Baba to purchase the computer. If anyone wants to send a little more for the external drive to used for back up please send it to me through PayPay using the address above in the first post. I have a number of copies of Fundamental Thoughts by Dr. Mahanamabrata Brahmacari on my shelf as well as copies of an old book I edited years ago in Kolkata called Gifts of Sacred Wonder. The latter book has essays by Jagadananda Das, Advaita Das, Gadadhar Prana Das, and myself. As a thank you for your contributions, I will send copies of one or the other (or both if you want them) to those who contributed and send me a private message giving me a mailing address. Perhaps we can also convince Baba to allow Blazing Sapphire Press to publish English translation(s) of the book(s) he creates on this new computer. Thanks to Karunamayi Dasji for facilitating the purchase of the computer and helping Baba set it up. We look forward to reading his book. If anyone wants to contribute a few dollars more, we can get him an external backup drive so his work is safe from loss.